Acupuncture is one of the main techniques in Traditional Chinese Medicine, originating approximately 3000 years ago in ancient China. 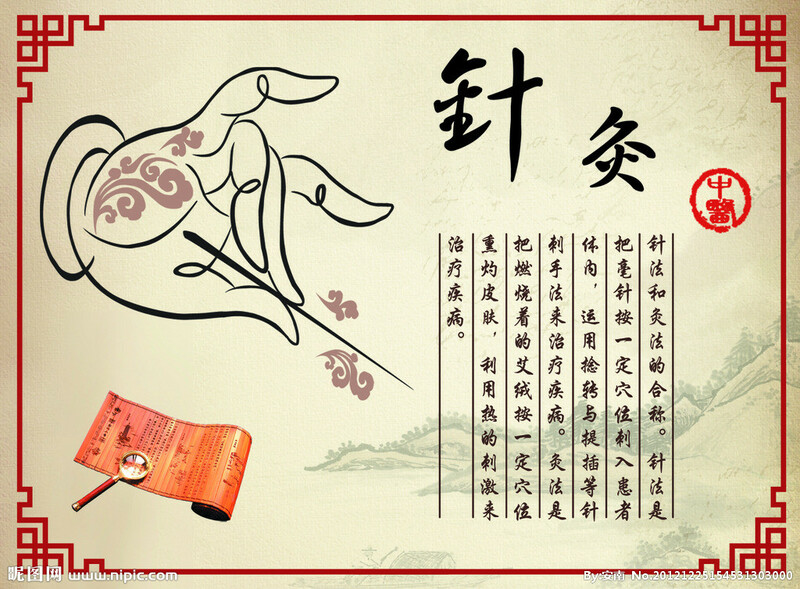 The earliest written record of acupuncture is found in the Yellow Emperor’s Inner Canon, date around 200 B.C.E. Works on acupuncture from throughout dynastic history have been uncovered, and acupuncture (along with traditional Chinese medicine techniques) continue to be practiced popularly in clinics and hospitals in Eastern Asian countries. Acupuncture gained popularity in the U.S. in 1972, when New York Times reporter James Reston traveled to China with President Richard Nixon on an official diplomatic visit and received acupuncture treatment for post-operative pain and recovery after an emergency appendectomy in Beijing. Reston, thought doubtful of the unfamiliar treatment, experienced pain relief afterwards and wrote an article about it in the Times. In recent decades, the use of acupuncture has become increasingly popular after the FDA has recognized the status of acupuncture needles as Class II medical devices in 1996, deeming them safe and effective when used appropriately by licensed practitioners. Various studies on acupuncture utilization suggests that from about 5-25% of people in the world, regardless of nationality or ethnicity, will at some time try acupuncture. 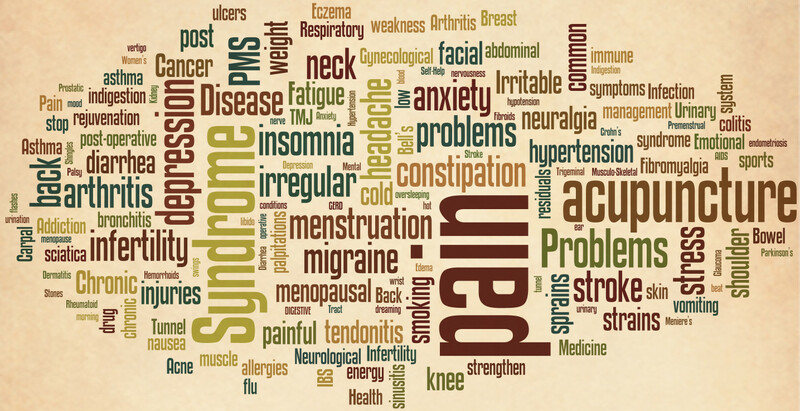 Conventional therapies are often used along with acupuncture in these cases. Several mechanisms have been proposed to explain acupuncture’s effects, primarily those on pain. Acupuncture points are believed to stimulate the central nervous system to release signaling chemicals into the muscles, central and peripheral nervous systems, and brain. These chemicals either change the experience of pain or release other compounds, such as hormones, that influence the body’s internal regulating mechanisms. The biochemical changes may stimulate the body’s natural healing abilities and promote physical and emotional well-being. Changes in brain chemistry, sensation and involuntary body functions: Studies have shown that acupuncture may alter brain chemistry by changing the release of neurotransmitters and neurohormones. Acupuncture also has been documented to affect the parts of the central nervous system related to sensation and involuntary body functions, such as immune reactions and processes whereby a person’s blood pressure, blood flow and body temperature are regulated. The 2007 NHIS data indicated 6.5% of Americans had reported ever using acupuncture. Of these, 22% had seen an acupuncturist in the last 12 months, and 25% of those who had tried acupuncture had done so at least once, and 70% had seen an acupuncturist at least 5 times. The majority of those who had seen an acupuncturist had done so usually for some kind of pain, primarily arthritis and other orthopedic pain, headaches, or fibromyalgia. The study results showed growing popularity among those with chronic conditions that impact the quality of life and self sufficiency. There is general agreement that acupuncture is safe when administered by well-trained practitioners using sterile needles. Because acupuncture needles penetrate the skin, they are required by law in the U.S. to be sterile, disposable, and used only once, identical to the regulations for similar needles used in hospitals and clinics. There is no risk of bacterial or viral infection when sterile one-time-use needles are applied. Adverse effects are exceedingly rare and are usually associated with poorly trained and/or unlicensed acupuncturists. The majority of side effects reported are minor, mainly slight bleeding at entry site (2.9%), hematoma (2.2%), and dizziness (1%). The use of acupuncture has become increasingly popular and endorsed by the United States National Institutes of Health, the National Health Service of the United Kingdom, the World Health Organization, and the National Center for Complementary and Alternative Medicine (a sub-division of the NIH). The general theory of acupuncture is based on the premise that bodily functions are regulated by an energy called Qi (pronounced “tch-ee”), which flows throughout the body. 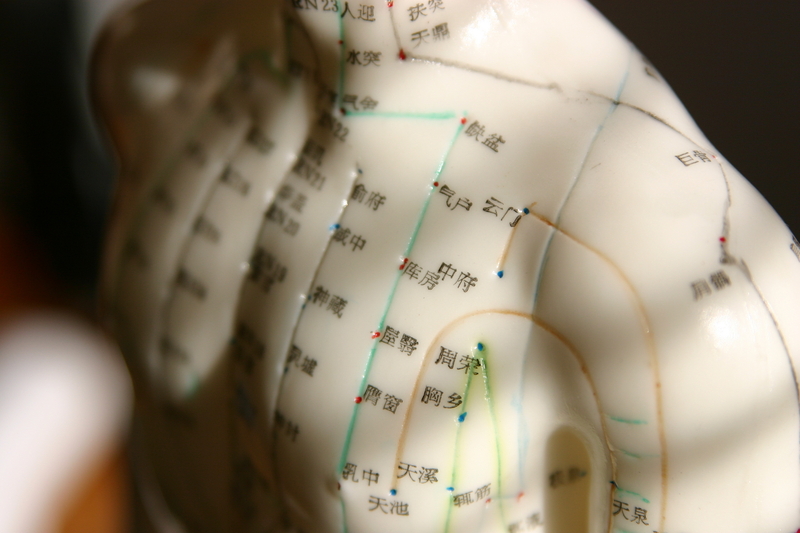 Traditional Chinese medicine theorizes that there are more than 2,000 acupuncture points on the human body, and that these points connect with twelve main and eight secondary pathways called meridians. These meridians transport Qi throughout the body. Qi is believed to regulate spiritual, emotional, mental and physical balance and is influenced by the opposing forces of Yin and Yang , the two elemental extremes that exist in all situations and media. When Yin and Yang are balanced (this may changes due to seasonality, body conditions, new living environments, etc. ), the body is healthy and adapts to its external surroundings and internal conditions. Disruptions of this flow of Qi are believed to be responsible for causing imbalances in these elemental forces and allows the body to fall out of sync with its most optimal state, thereby causing disease. Acupuncture is believed to balance Yin and Yang, restore the normal regulated levels of Qi, which then restores and maintains health to the body and mind. Traditional Chinese medicine practices (including acupuncture, Chinese herbal medicine, diet, massage and meditative physical exercise) all are intended to balance Yin and Yang and to regulate the flow of Qi.